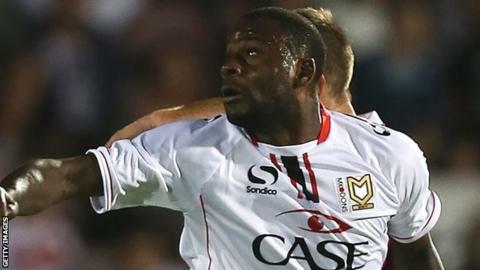 Northampton have signed MK Dons striker Izale McLeod on loan to 4 January. The 29-year-old, who was linked to the Cobblers earlier this month, has scored four goals in 21 appearances for the Dons this season. Manager Aidy Boothroyd told BBC Radio Northampton: "The chairman has put his hand in his pocked again, which is really appreciated. "We've managed to bring in a player proven at this level. We're going to need a bit of depth in the next month." He continued: "Luke Norris and Jacob Blyth have done very well, but when you get to three games a week, it's nice to have that depth to freshen it up. "That competition for places is something we've got in every position, but we've also thinned out the squad elsewhere." Dons signed McLeod for his second spell at the club in January, following his release by Portsmouth. He has scored 122 career goals in 380 appearances and will bolster a Cobblers attack which has failed to find the net score in 10 league and cup matches this season. Meanwhile, manager Boothroyd still hopes captain Kelvin Langmead will be able to play this season. The 28-year-old had knee surgery in July and hoped to return this month, but the date has been pushed back. Striker Alex Nicholls has also endured a long time on the sidelines after surgery on his leg in October 2012. "I'm hoping we'll see both before the end of the season. It would give everyone a lift," said Boothroyd. "They've got the injuries on behalf of the crusade we're on and it does become upsetting, both from a purely selfish point of view and when you empathise with them and their plights." Chris Hackett, Roy O'Donovan and Clive Platt have also carried knocks from last season into the current campaign, but O'Donovan is hoping to return from surgery on a hernia problem within weeks.